I love getting this post ready every year!! It means that school is out, and I am already planning for the next year. I am trying something new this time – a clipboard planner. I will post it as soon as I have it assembled! Homeschool Launch 16 pages of files!! 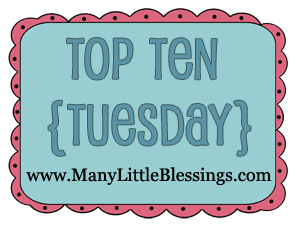 This week’s 10 in 10 topic is Your top 10 must have Items! Educating the WholeHearted Child This is the only book that I won’t loan out! The Clarksons paint a beautiful picture of what I want our homeschool to be. It is filled with helpful advice and is saturated with scripture. Mini Dry Erase Boards Each of my kiddos has a small dry erase board – found in the Target Dollar Spot every year at back-to-school time. They are free to use them at any time to practice subjects, or even just to doodle. You can play fun trivia games by having everyone write secretly their answers & seeing who was correct. And it will keep a preschooler busy for quite some time! White Copy Paper I allow the kids to use as much copy paper as they want, as long as they aren’t wasting it. They make books, signs for their bedroom doors, cards, watercolor pictures, and whatever else their imaginations dream up. Playdoh Who doesn’t love to play with Playdoh? Ours gets pulled out most often during winter when it is too cold to play outside. Library Card (I wonder if this is on all the lists? LOL) We are blessed with a wonderful library just down the street! My kids have total control of the books they check out (within the boundaries of what they are allowed to read). While they are browsing, I snag seasonal books and any that go along with our studies. I fill a big basket with my choices and sit it in the corner of the living room – it is amazing how interested the kids become when they don’t HAVE to read them! Timers I have a little basket filled with digital timers that I bought at Dollar Tree. We use these for keeping track of reading time or seeing how fast a math page can be finished. Netflix Streaming We only allow educational shows to be watched during school time, and Netflix has so much to offer! The Blue Planet series is stunningly beautiful, and Creatures That Defy Evolution is simply amazing. I usually leave the room though, because their favorite shows tend to involve things like weird & freaky bugs. Ick!! 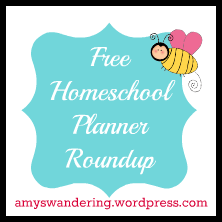 My Customized Planner Y’all know my love of free stuff, so it should come as no surprise that I create my own homeschool planner using bits & pieces from this list of free homeschool planners. I will be sharing my 2012-2013 planner in the next couple of weeks, so stay tuned!! LiveBinders Oh how I adore LiveBinders! If you are not familiar, they are free online organizers. 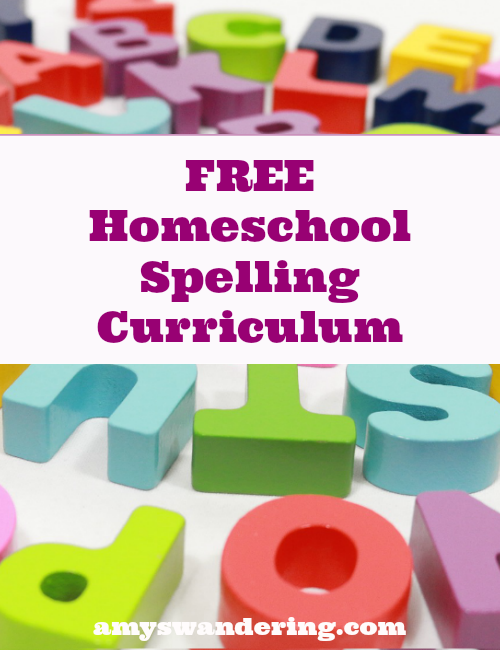 I use one for all of my Homeschool for Free links. I have seasonal LiveBinders to corral all of those great ideas I find on Pinterest. I also use them to plan out my curriculum for the year – check back next week to find out how! Are any of these in your Top 10? I had a little (ok, BIG) project planned for summer: learn how to create my own notebooking pages! I wanted pages that were very specific to what we will be studying next year, but I was NOT looking forward to the time involved. 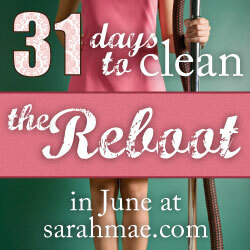 I attended a little Facebook party on Tuesday night that changed my plans! The party was to introduce The Notebooking Publisher. The Notebooking Publisher has 100s of templates that will allow me to completely customize our pages. It is easy enough to use that my kids will even be able to create their own pages however they want! But wait… there’s more! The Notebooking Publisher is part of the NotebookingPages Treasury Membership. A Treasury Membership gives you access to everything on the NotebookingPages site. EVERYTHING! Your membership includes updates every 4-6 weeks. And get this – you ALWAYS have access to the pages. If your membership expires, you will no longer get the updates with new pages. Yearly renewal is only $29.95. I just purchased my membership & can’t wait to get started! !